We are thrilled to offer our 2018-19 season of Arts Education programming (see listing below) and hope that you will take advantage of these high quality educational and enriching programs! Please note that Virginia Standards of Learning & Curriculum Connections as well as synopses are listed beneath performance titles. To learn more about a production, please click the website link under the show. Study Guide links will be completed soon. Grade level designations are meant as guidelines. Performance Running Times: All Arts Education performances are 60 minutes unless otherwise indicated. 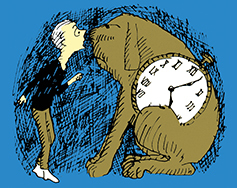 Performance Dates & Times: As there are multiple times for most performances, and multiple days in the case of The Phantom Tollbooth, Freedom Bound, and Diary of a Worm, a Spider, and a Fly, please pay careful attention when requesting seats for your group. Arts Education Program brochures will be sent to all schools and home school groups beginning August 10, 2018. REGISTRATION Information: Reservations are required with a completed registration form. Registration for the season will open on Tuesday, August 21, 2018. Tickets are $8.50 for students and teachers/adult chaperones. Frequently Asked Questions: Click HERE to find a list of frequently asked questions. If you have any questions or would like more information about the Arts Education Program, please contact Cathy von Storch, Education & Outreach Manager at 434-293-1000 or cathyvonstorch@theparamount.net. 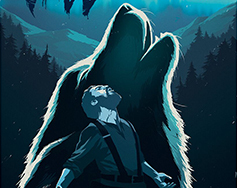 This multi-media adventure, based on the novel by Jack London, mixes classic storytelling with projected illustrations to tell the story of Buck, the magnificent offspring of a St. Bernard and Scottish Collie. Kidnapped from his lavish life on a California estate and sent to work as a sled dog during the great Klondike Gold Rush, Buck fights to survive and becomes the most famous dog in the history of the northland. The production uses 180-degree projection that surrounds the performer. It features a unique mix of illustrations from the book, brand new drawings and animations, as well as a live original score that accompanies the production. SOL Connections to English: 4.1, 4.4, 4.5, 4.7, 4.9, 5.1, 5.4, 5.5, 5.7, 5.9, 6.2, 6.4, 6.5, 6.7, 6.9, 7.1, 7.4, 7.5, 7.7, 7.9, 8.4, 8.5, 8.7, 8.9; History & Social Science: VS.1, VS.6, USII.1, USII.2, USII.4, USII.6, CE.1; SOL Connections to Science and Mathematics; Curriculum Connections to the concepts of hardship, discipline, will power, persistence and survival; environment, adaption and relationships; imagination, creativity and innovation; native peoples. 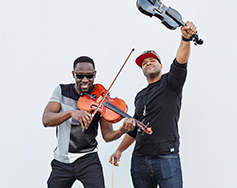 Black Violin is the exhilarating violin/viola hip-hop duo of classically trained musicians Kevin “Kev Marcus” Sylvester and violist Wil “Wil B.” Baptiste. The two met as high school orchestra musicians, studying classical music and the great composers while immersing themselves in rap and hip-hop; today they play genre-bending music, creating the ultimate synergy between classical and hip-hop music, creating a distinctive multi-genre sound that is often described as “classical boom.” Black Violin has shared stages with such top acts as Kanye West and Aerosmith, and has collaborated with the likes of Wu-Tang Clan and Alicia Keys. In addition, they have performed for hundreds of thousands of students throughout N. America and Europe. Baptiste and Sylvester say that while classical music and hip-hop may seem worlds apart, both are meant to bring people together. The band is endorsed by Yamaha Music, and has partnered with the National Association for Music Manufacturers (NAMM) to continue their advocacy for accessible music education. SOL Connections to Music: 4.7, 4.8, 4.11, 4.13, 4.14, 4.15, 5.7, 5.8, 5.11, 5.12, 5.17, 6.7, 6.8, 6.9, 6.10, 7.7, 7.8, 7.9, 7.10, 8.7, 8.8, 8.9, 8.10, HG.6, HG.7, HG.8, HG.9, HG.10, HG.11; SOL Connections to Theater Arts, Middle School Instrumental, Middle School Vocal/Choral, High School Instrumental and High School Vocal/Choral; Curriculum Connections to the concepts of friendship, collaboration, stereotypes, diversity, empowerment, culture barriers, inclusion, unity, fusion, synthesis, classical music, hip-hop music, jazz, rhythm and blues, electrical amplification and personal passion. Dragons love all sorts of tacos—except spicy ones! When a boy throws his new dragon friends a spicy salsa taco party, red-hot trouble ensues. This story-packed musical revue brings to life five beloved contemporary children’s books: Dragons Love Tacos by Adam Rubin; the bed time adventures of Interrupting Chicken by David Ezra Stein; The Dot by Peter H. Reynolds with young Vashti’s discovery that she is an artist, after all; Mercy the pig’s unexpected adventures behind the wheel when Mercy Watson Goes for a Ride by Kate DiCamillo; and a tale of enduring friendship between a girl and her loyal horse in Erica Silverman’s Cowgirl Kate and Cocoa: School Days. Foundation Blocks for Early Learning (PreK), Connections to Literacy, Mathematics, Personal and Social Development, Visual Arts and Music; SOL Connections to English: K.1, K.2, K.3, K.8, K.9, K.12, 1.1, 1.8, 1.9, 1.13, 2.3, 2.7, 2.8, 2.12; Mathematics: K.2, K.8, K.11, K.13, 1.1, 1.9, 1.12, 2.11; SOL Connections to Music and Visual Arts; Curriculum Connections to the concepts of adaptation, musical, interruption, cause and effect, friendship, devotion, rules and weakness. No one is safe as a reign of terror rips through 1692 Salem. Led by Abigail Williams, a group of girls who claim to have seen the Devil hurl out charges of witchcraft, sending those who won’t confess to the noose. When the accusing finger points to his wife, John Proctor is forced to confront his past and determine his future. Arthur Miller’s searing drama, inspired by the McCarthy era, comes to vivid new life in the National Players’ bare-knuckle staging. 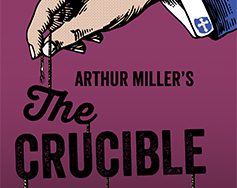 A piercing look at what can happen when truth is bent to political convenience, The Crucible is a powerful story for our time. SOL Connections to English: 9.3, 9.4, 9.6, 10.3, 10.4, 10.6, 11.3, 11.4, 11.6, 12.3, 12.6; History & Social Science: WHII.3, WHII.4, WHII.6, WG.6, VUS.2, VUS.3, GOVT.17; SOL Connections to Theater Arts; Curriculum Connections to the concepts of allegory, modern politics, symbolism, witchcraft, accusation(s), reputation, lies and deceit, hypocrisy, fear and violence, hysteria, macrocosmic unrest, ideological opposites, fact vs. fiction, McCarthyism, Puritan culture, intolerance and religious fanaticism, compassion and forgiveness, motivation and behavior, and justice. Tomás loves stories. As the young son of migrant farm workers, he spends the summer with his family following the crops north from Texas to Iowa, passing long days in the field listening to his grandfather tell stories. When a chance encounter brings him to the local library, he meets the “Library Lady” who recognizes his thirst for knowledge and encourages him to read. His delight in books is equaled by his pride in teaching her Spanish, trading knowledge and respect between generations and cultures. Based on the beloved book by Pat Nora, this bilingual musical tells the true story of the Mexican-American author, poet, and educator Tomás Rivera and illustrates the power of imagination, self-respect, and positive encouragement. SOL Connections to English: K.1, K.2, K.8, K.9, K.12, 1.1, 1.7, 1.8, 1.9, 1.13, 2.3, 2.6, 2.7, 2.8, 2.12, 3.4, 3.5, 3.9, 4.1, 4.4, 4.5, 4.7; History & Social Science: K.4, K.6, K.7, K.8, 1.4, 1.8, 1.9, 1.10, 2.4, 2.8, 2.9, 2.10, 3.8, 3.9, 3.11, 3.12; SOL Connections to Family Life; Curriculum Connections to the concepts of immigrants, fear, hardship, perseverance, friendship, opportunity and literacy. “There once was a boy named Milo who didn’t know what to do with himself – not just sometimes, but always.” When a mysterious tollbooth appears in his bedroom, he drives his toy car through it and finds himself on an eventful quest to rescue the Princesses Rhyme and Reason – who, in the war between words and numbers, have been banished to the Castle in the Air. With the help of steadfast companions, Milo discovers the delights of friendship, curiosity and knowledge, and ultimately that life is filled with endless possibilities. 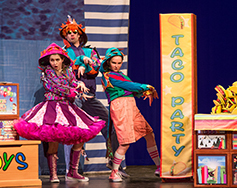 Enchantment Theatre Company brings Norton Juster’s fantastical classic to life using puppets, masks, magic, inventive scenic effects and original music. SOL Connections to English: 2.1, 2.3, 2.7, 2.8, 2.12, 3.1, 3.4, 3.5, 3.9, 4.1, 4.4, 4.5, 4.7, 5.4, 5.5, 5.7; History and Social Science: geography and map skills; Mathematics: numbers, functions, time, averages and geometry; SOL Connections to Visual Arts and Performing Arts; Curriculum Connections to the concepts of fantasy, perseverance, friendship, humor, courage, ignorance, curiosity, insight, point of view and knowledge. 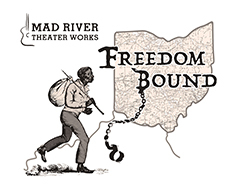 Freedom Bound tells the true story of Addison White and his escape from slavery in Kentucky, his flight north on the Underground Railroad, and his rescue by the citizens of Mechanicsburg, Ohio. This important and turbulent chapter of American history comes to life through original songs, riddles and rhyme, and an array of characters that emerge from the past and relive the journey of the Underground Railroad. 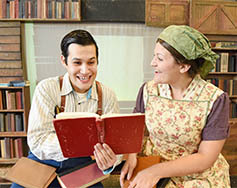 Mad River Theater Works creates vibrant and evocative plays that combine the rhythms and folkways of everyday life with tales about extraordinary individuals. The company returns to The Paramount for a 10th season! SOL Connections to English: 3.4, 3.6, 3.7, 4.1, 4.4, 4.5, 4.6, 5.1, 5.4, 5.5, 5.6, 6.4, 6.5, 6.6, 7.1, 7.4, 7.5, 7.6, 8.4, 8.5, 8.6; History & Social Science: 3.10, 3.11, 3.12, VS.1, VS.7, VS.8, USI.1, USI.8, USI.9, USII.1, USII.3, USII.4, CE.1, CE.3, CE.4, CE.6; SOL Connections to Music and Theater Arts; Curriculum Connections to the concepts of slavery, resistance, literacy, escape and rescue, system of justice, freedom, Underground Railroad and The Fugitive Slave Act. Seven actors, two feet off the ground, sharing 21 square feet of space manage to recreate the entire American fight for independence from Lexington to Yorktown! 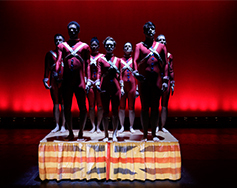 An incredible feat of imaginative physical theater, the spirited and multicultural ensemble from Chicago’s award-winning Theater Unspeakable conveys a vast historic cast of characters and a thrilling amount of drama. With lightning speed they jump from patriot to loyalist to George Washington to King George III, and consider the roles women played in the war, all via amazing physical and vocal dexterity, brilliant humor, and a dash of derring-do! SOL Connections to History & Social Science: USI.3, USI.4, USI.5, USI.6, CE.2, CE.3, CE.4, WHII.4, WHII.6, WG.5, WG.6, WG.10, WG.12, VUS.2, VUS.3, VUS.4, VUS.5; English: 5.6, 6.6, 7.6, 8.6, 9.5, 10.5, 11.5; SOL Connections to Theater Arts and Music; Curriculum Connections to the concepts of Physical Theater (movement-based narrative), mime-based choreography, epic time period, complexity, slavery, taxation, sacrifice, slaughter, subjugation, human rights and personal freedom. 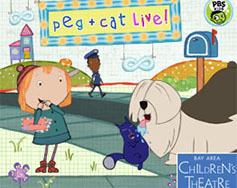 Based on the Emmy-winning PBS Kids show PEG + CAT (produced by The Fred Rogers Company and 9 Story Entertainment), this spectacular musical features wild comedy, countless favorite songs from the show, and Peg’s super coolest pal Ramone! When Peg’s Mom asks Peg and Cat to mail some really important letters they come face to face with a really big dog. Really Big Problem! To solve it, they’ll need math—bar graphs, size comparison, position words, fair sharing, and a whole lot of counting. They’ll also need to count on each other, and the audience too, for their problem to be solved. PEG + CAT inspires students’ natural curiosity about math and celebrates the ways in which math plays a role in their daily lives. Foundation Blocks for Early Learning (PreK), Connections to Literacy, Mathematics, Personal and Social Development, Music and Visual Arts; SOL Connections to Mathematics: K.2, K.8, K.10, K.11, K.13, K.14, 1.1, 1.10, 1.14, 1.15, 2.11, 2.17, 2.18, 2.19; English: K.1, K.2, K.3, K.8, K.9, K.12, 1.1, 1.8,1.9, 1.13, 2.3, 2.7, 2.8, 2.12; SOL Connections to Music and Visual Arts; Curriculum Connections to the concepts of problem-solving, counting, graphs, size, position, shapes, friendship, responsibility and sharing. In the coolest ever rock-n-roll romp in a bug’s world, insects rule in the diaries of unlikely best friends: Worm, Spider, and Fly. Worm eats his homework, Fly believes she has superpowers, and Spider can’t wait to grow up and molt. 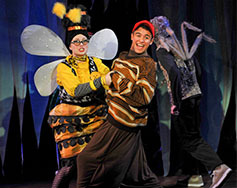 Promoting eco-consciousness, earth science, and tolerance of others, Dallas Children’s Theater presents a joyful, hip musical exploration of the world outside, and cleverly captures all the droll humor and whimsy of Doreen Cronin’s beloved and award-winning books: Diary of a Worm; Diary of a Spider; and Diary of a Fly. As the hopes and dreams of these amiable insect characters come to life, you might just find that a bug’s life is not all that different from your own! SOL Connections to Science: K.7, K.9, 1.5, 2.4, 2.5, 2.7, 3.4, 3.6, 3.8, 3.10, 4.5, 4.9; English: K.1, K.8, K.9, K.12, 1.1, 1.2, 1.8, 1.9, 1.13, 2.2, 2.7, 2.8, 3.4, 3.5, 3.9, 4.4, 4.5, 4.7; SOL Connections to Mathematics and the Arts. Curriculum Connections to the concepts of diversity, inclusion, confidence, exploration, anthropods, adaptation and ecosystem. Pricing: Tickets for all students and teachers/adult chaperones are $8.50. Students and school groups that qualify for free and reduced meals may receive financial assistance. Performance Run Times: All performances are 60 minutes unless otherwise noted. Study Guides/SOL Connections: Virginia Standards of Learning + Curriculum Connections and synopses are listed beneath performance descriptions. Grade level designations are meant as guidelines. More Information: Please direct all Arts Education related questions to Cathy von Storch, Education & Outreach Manager at 434.293.1000 or cathyvonstorch@theparamount.net.